A landing page is a standalone web page designed with the singular purpose of getting visitors to take an action. For authors, of course, the action is to buy your book. The main features of a landing page are by design, very few. No headers, sidebars, footers, widgets or any other distraction from the sole aim of the page. But this means that if you try to add a landing page to your blog or website, it will not work because the page and post structures are set by the site theme. To create landing pages, you need to take a different route. If you are using a self-hosted WordPress site, it is very easy. All you need to do is add a free plugin called Elementor, which is a dedicated page builder. Selecting the Elementor Canvas template will then enable you to create landing pages from a blank canvas without any headers, footers or sidebars. If you use a free blogging platform such as WordPress.com, Wix or Blogger, you can still create landing pages for your books, but each platform has a different method. Use the links below to find out how you can create landing pages on your platform. Nice landing page, but where is it? While most authors are certainly not accomplished website designers, it doesn’t take a lot of effort to create an eye-catching landing page for a book. There are a lot of well-designed templates available, and with only a little imagination and modification you can certainly create a page with a pleasing design. As there very few elements and only very basic text on a landing page, there is not much to do. There are thousands of examples of landing page design, but most are for subscription sign-up forms, lead generators and SEO experts. These types of pages are not really suitable for authors trying to sell books. 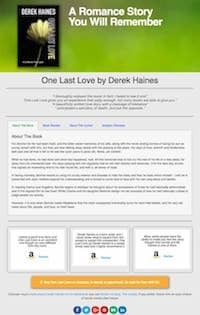 To promote a book using a landing page, all you really need is your book cover, a short description and a buy button. There are many other elements that can be included, but in the end, it will be a matter of trial and error to see what works for you. Because it is a single page, there is nothing to stop you creating a number of versions to see which one works best. 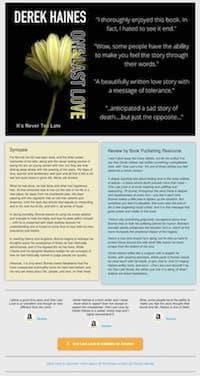 Here are a couple of examples of book landing pages that I created very quickly using WordPress and Elementor, to give you an idea of what is possible. I created these landing pages in about twenty minutes, so neither is perfection in page design, animation or structure, but they will hopefully give you a better idea of what you can do to promote your books using a landing page. So you now have a beautiful landing page, but no one is going to find it unless you do some hard work. There are two ways you can attract traffic to your book landing page. One, you can tell people on social media or add text links in your blog posts, but these people probably already know all there is to know about your books. Sure, they might visit your page, but will the buy? Probably not. You need to take the second option, which is to use SEO (Search Engine Optimisation) to get your new landing page indexed by search engines and then attract totally new visitors to your page. While it might sound difficult, it really is not. All you need to do is write a great SEO title for your page. This needs to be a maximum of 50 characters. If your platform allows, you should also write an SEO description. Usually a maximum of 150 characters. Don’t think your author name and book title will work, because they won’t. Why? Because no one is going to go to Google and search for you or your book title. You need to put your thinking cap on and try to anticipate what people search for that can be related to your book. The easiest way to do this is to use Google. Here’s an example. Let’s say your book title is The Sweet Sisters of Clyde and your author name is D. L. Smithson. Neither, alone or in combination will get many search results. I got a few hundred thousand results, which is not a lot. But, if your book is a romantic comedy set in Kentucky in the 1840s, why not use your book’s setting and themes to build an SEO title that will get Google results? Now, try searching Google for, “Kentucky Romance In 1840’s Set The World On Fire”. This got over 30 million results! Get the idea of SEO? Easy, huh? I am no expert on how to design a killer landing page, nor about the intricacies of SEO. But even with my limited knowledge and abilities, I can design a book landing page that works. Could my pages work better? For sure, so I keep experimenting, trying new things and reading articles on the subject to help me fine tune my landing pages. Having a book landing page, or pages are not going to achieve a lot if no one visits. The only way to know is to keep a close eye on your traffic. You can do this with some of the tracking and statistics tools on your site, but the best is to use Google Analytics to track your success. For those with a little technical know how you can even track clicks on your buttons by using Google’s Campaign Builder. I must have written this 1,000 times. Do not use the phrase, “Buy My Book” on social media or in your blog posts. But now you can scream it loudly from the rooftops on your new, totally dedicated Buy My Book landing pages. Because that is exactly what landing pages are designed to say and do. Note: There is a follow-up article about how to track landing page data to track your book landing pages. Hi, I have a question about the landing page for authors on a self-hosted WordPress site. Do you need a separate domain for each book or book series? Appreciate the article. Thanks for the tips and clear, easy-to-understand content.